Do you like Bucharest? A spanish guy asked me a few years ago, while I was kayaking on the Danube. No, without hesitation in my voice. Strange, he replied, this is the 39 time I ask someone living there this question, and I always get the same answer. Another friend, moved in western europe, asked me a long long time ago if I am happy in Bucharest, I said no, so she asked why not move? During my childhood I had a double life. kindergarten and school in a small city, holidays at the grandparents in the countryside. Each time I was brought back from the country side I started crying. So now as an adult I tried to reconstruct some of the countryside happiness, a place with an orchard, flowers, dirt, grass, birds, stones, snails, worms, clouds and night stars. It is so refreshing. Still, at the countryside, I got surprised and scared about missing Bucharest. Is it the comfort I got used to that I was missing? In time, as the countryside comfort grew, I got it that it was not that. It was something else. The people mostly, but not only that. If i compare Bucharest with a bee hive or an ant nest, I was missing the wonderful structures the collective has build for it’s own delight. So a little late in my life I got it, how blessed I am to live in a space where people have put so much work in building public shared spaces for everybody to enjoy, that are impractical to have, if they do not have a high enough number of users. The olympic swimming pool, on top of my list. The running track on the athletics stadium. The sports coaches and their followers. The quiet streets with beautiful old buildings, that I enjoy on a late walk or bike trip. The good restaurants. The kebab. The market with fruits and vegetables from all over the world. The yoga classes. The facebook events. The dancing clubs. The coffee shops. The 3D cinemas. The pizza. The theaters and concert halls. The sushi. The coworking hubs. The bakeries. The relieve that this list is every day changing, that events and places bloom even in the coldest of winters. So yes, now I really like big cities. And I wish Bucharest was a better city to live into, as it has his construction flaws. And hope that people living here will work and fight for making this place better, as it has his big big problems, compared to other european capital cities. Sounds too good to be true, but I found that these techniques work really well. Most of the times avid readers already use the same strategies, without being conscious about it. About “10 Days to Faster Reading” I learned from the Personal Mba list (which is also on Blinkist). It did not make a huge difference for me, as I already reading quite fast. But even a 10% increase in speed, which I noticed already, for a book that takes me 5 hours, is 30 minutes of time gain. For a slow reader, using this book, the reading speed could double. Photoreading is a different story. This technique made in my case a huge difference. Is perfect for reading tourist guides before holidays, for documentation, and for getting an idea about a book that I am curious about, but do not have the time to actually read. I also noticed that photoreading a book, before reading it normally, enhances my level of comprehension and the retention of ideas. Now I “preview” each book I read (I read the table of contents, the subtitles, the first and last paragraph of each chapter). Then I “photoread” the book (it’s all explained in the photoreading book). Then I actually read it, if I still find it’s worth it. Now I always have a clear purpose in my mind, when I read a book, no matter the technique. And I have no remorse to decide not to read a book, or parts of it, if they do not help me. The question is: can I improve this even better? What other strategies do you use? One Ted I reviewed these days. – In time I saw big progress: in the beginning I had to revert from running to walking for 5-6 times during the workout, to keep my heart rate interval. After patiently exercising for 5-6 times, I am now able to run all through the exercise, keeping the same heart rate interval. And a small review of Mio Alpha 2. I like the heart rate watch very much, except that sometimes I carry also a sports watch, as Mio’s watch functions are minimal. From this point of view, the cheaper Mio Fuse Activity Monitor is more onest. Mio hardware is great, but the MioGo software has one major flaw: no share capability. I can not post my heart rate recordings on facebook, or email them to a coach or a friend. I really hope they fix this soon. They cured my plantar fasciitis two years ago, no relapse since (and I started to run again). I have them from a foot doctor that made a study on 50 patients, and cured most of the cases in 3-5 weeks. 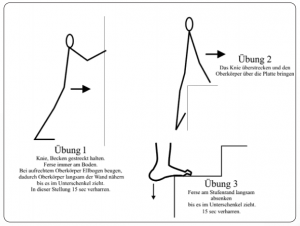 How they work: by relaxing, increasing the length and elasticity of the calves and Achilles tendon, so that when we walk, the fascia is not forced to stretch. When the back side of the leg is tense, the fascia is stretched and gets microtears because it is “the weaker link”. The second “trick”: making the stretches immediately when waking up, before starting to walk, so that the fascia microtears circle breaks (the leg is so much tenser in the morning). Standing up, with hands on the wall. All weight on the healthy foot. Knee, pelvis, back kept straight. Heel always on the floor. While keeping the upper body straight, bend elbows, thereby the upper body slowly gets closer to the wall, until the lower leg is stretched. In this position remain 15 seconds. Repeat for 10 times (it takes 3-5 minutes). This is the most important exercise. Near a table, with the hands on the table, the foot like in the picture. Keep knee hyperextended and get the upper body over the tabletop. Repeat 15 times. On a step, with the weight on the healthy/other foot. Heel over the step-edge slowly sink, until the lower leg is stretched. Keep this position for 15 seconds. Repeat for 10 times (it takes 3-5 minutes). The exercises should be repeated in the morning before walking and again 2-3-4 times in the day as needed, especially after sitting for a long time. For 3-4 weeks, it helps wearing shoes with a little bit of a heel (2-5 cm), to compensate for too short calves/Achilles. 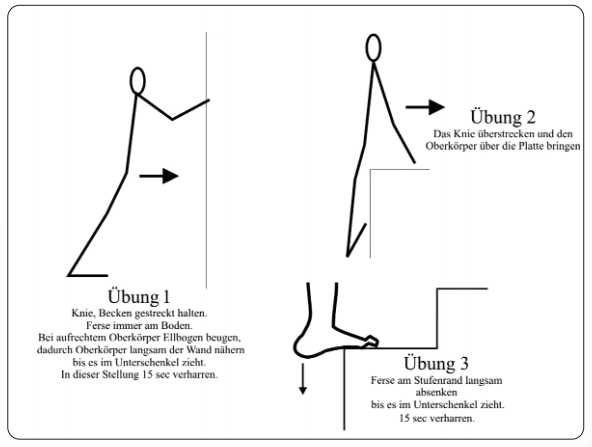 The original description of the exercises is here, but in German. A detailed description , also in German, here. After my movement quality test, I looked more about minimalist shoes and foot health, so I stumbled upon Kathy Bowman’s book “Whole Body Barefoot: Transitioning Well to Minimal Footwear“, which I read in a blink of an eye. Then I looked about her blog and other books (that I have already read). My mind was blown away by her latest book, “Move Your DNA: Restore Your Health Through Natural Movement“. This I consider the best book about health that I have ever read. And one that turned up side down and made me reconsider everything I knew on the subject. To the point that I could not help bring the subject about in any conversation that I had. So not to bring that any more into the discussion, as it is so full of meaning that is impossible to resume, I thought best is just to write this post about the book, and if you are curious, please read it. Or listen to the audiobook, marvelously read by the author. Debugging and optimizing the movements involved in running and cycling is a constant need that I have, in the quest to enjoy and progress, pain free, with these sports that I like. Browsing the internet for new perspectives, I found about, while looking at ideas from Tim Ferris and Stuart McGill, about a inovative guy named Gray Cook. He was warmly recommended for injury prevention strategies. I looked a few videos on youtube, and decided to read his “Movement” book. His other famous book, “Athletic Body in Balance“, seemed more advanced, I saved it in my “wishlist”. The ideas in the book impressed me a lot. As a IT person, I was extremely suprised to see an algorithmical and test driven aproach to the general quality of human movement. The book explains in extraordinary detail the importance of efficient body movement. And it describes so clearly the principles that one can apply when unit testing and then debugging and improving movement quality. And today is the perfect moment to observe wisdom of crowds in action. As green energy usage has grown from an insignificant less than one percent amount, to a significant slice of the yearly average and more than 50% of power production for the peaks (very sunny summer days or extreamly windy days). But there is a but. The old power grid requires that the power usage equals power generation. This worked ok during the old days, when the power generation was constant, and has become a nightmare when power generation massively fluctuates . An extreme example: the solar eclipse at noon, on 20 March, if it will be a sunny day, will make power management a nightmare for Germany, more explanations here. The problem is that we currently do not have a cheap battery technology to allow efficient and with no significant environment damage to stock the peak green energy output until the moment it is needed. And this problem is also a great business opportunity, someone could have huge gains from buying energy cheap and selling it at a high price when the demand is great. Not to mention that if the battery is highly reusable, the gain is multiplied by the number of reloads…. Of course we also need better battery technology for our mobile devices (smartphones and laptops), and mostly for electric cars. But this is a secondary issue, we have the current batteries, that do their job, and electric cars can wait, while we use electic common transport in the city, electric trains for efficient long distance travel and the extraordinary already available bicycle technology. The question is how to store for a few days the huge power output of a solar plant or wind farm. Until now the problem could be ignored, while these technologies were not significantly used, but this is not the case anymore, not in Germany, and not in the United States either. So here it comes the wisdom of crowds. I did a quick search and found quite a few creative ideas for battery technology of tomorrow. Which technology(es) will win? Time will tell. The wisdom of inventors will team with the wisdom of users and the best will win. Pumped water storage in dams?